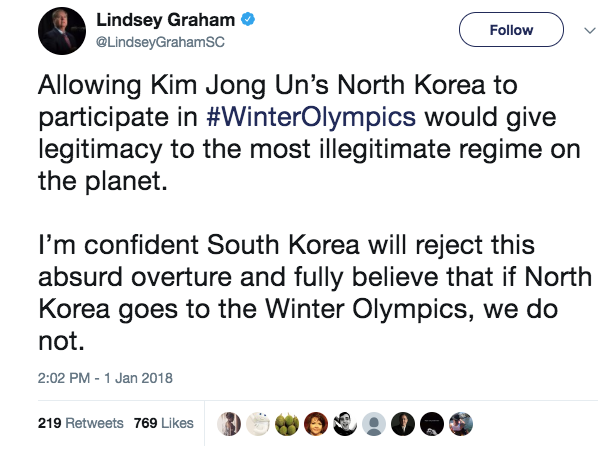 Sen. Lindsey Graham on Monday said the United States should boycott the Winter Olympics if North Korea attends. Graham’s comments come at a time when South Korea has offered to hold talks with North Korea next week that would focus on North Korea’s participation in the upcoming Winter Olympics, but would potentially include talks on North Korean decentralization, Reuters reported. “We look forward to candidly discussing interests from both sides face-to-face with North Korea along with the North’s participation in the Pyeongchang Winter Olympics,” South Korea’s Unification Minister Cho Myong-gyon said. After Kim Jong Un’s address, South Korean President Moon Jae-in told the government to move as quickly as possible to get North Korea to the Winter Olympics. Chun Yung-woo, a former South Korean national security adviser, said South Korea should have taken time before responding to Kim Jong Un’s address. North Korea may be trying to cause a rift between the U.S. and South Korea as a way to loosen sanctions against them, according to Tufts University Fletcher School Professor and North Korea expert Sung-Yoon Lee. “It paints Trump further into the corner as the aggressor, even when the crux of the matter is North Korea (has) an illegal nuclear program,” Lee said. “But whenever Kim takes a mini-step back, he’s able to make a U.S. president look like the aggressor. “One doesn’t need to be a genius to see that this is what North Korea does: After having created a war-like, crisis atmosphere, (Kim) takes a small step back and there’s a collective sigh of relief that there’s no war. It does wonders for North Korea’s image,” he added.